So, there was a week. And a weekend. We had rain. Lots of it at one point. 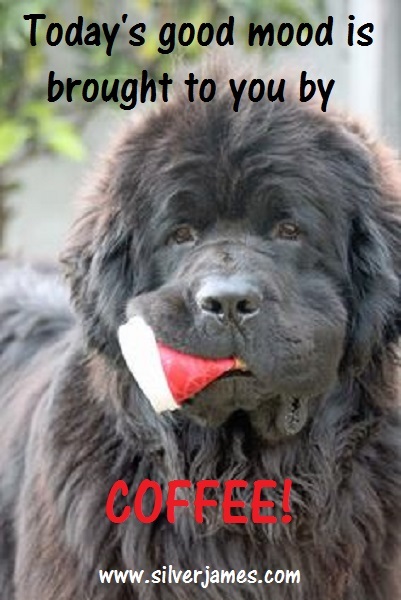 As y’all know, I have a full-blood Newfoundland–Cooper. And a Newf/Golden mix–Boone. Cooper has his own wading pool. Boone uses it for a giant water bowl. When it rains? Cooper goes out and sits on the patio. Right beneath the rain spout. Boone? He goes and hides in my closet at the first drop. Yeah…dogs. Anyway, along with the rain, we got humid weather. And some heat. And some not so heat…more like…warm heat instead of hot heat. Why yes, I am babbling. Why do you ask? See, I’m in revision hell. As I stare at a scene, taking into account the changes my editor’s requested, I begin to wonder if it wouldn’t just be quicker to chuck the whole thing and start over. I’m about 1/3 of the way through the manuscript. Scenes are being cut. Old scense previous cut are getting added back in. Information that needs to be there has to be woven in at a different point in the story. I wake up dreading to schlep into my office because I’m really starting to hate this story. Which makes me sad. I love these two characters. I want them to get their HEA. I know deep down my editor is right. That’s why he’s my editor. I trust him. But…damn. Anyway, I’m stuck in that headspace. Which means I’m pretty much brain dead. In better news, I have a new book coming out tomrrow! UNDER THE ASSASSIN’S MOON will hit the ereaders of those people who preordered around midnight tonight. It was a fun book, with more than a few twists. Long-time readers will get a surprise. I hope! And new readers will be intrigued enough to grab my Moonstruck backlist. Want to get your order in now? Just click on the book cover over there on the right. Speaking of, that’s one of my favorite covers. Only did an amazing job with it! My Cards are winning, mostly. They’ve really moved up in the standings and might–if they keep winning–make it into the playoffs. That would be a woot-woot! TV has pretty much become “Live PD” and “Nightwatch.” And baseball. I tend to fall asleep so I’m stuff I enjoy but I don’t have to focus on to understand. If that makes sense? Reading is pretty much relistens to books that I’ve heard recently because I have the attention span of a gnat. That said, B.E. Sanderson’s latest paranormal, SLEEPING UGLY, has hit my Kindle. I’ll be reading it as my eyesight allows! That’s another woot-woot! And that’s my round-up, follow-up, babble-fest. Chime in with your own babbles. How was your weekend? What are your plans for this week? Me? I’m going for another pot of coffee before settling back into revision hell. Wish me luck! This entry was posted in Writing Life and tagged critters, follow up, fun stuff, herding cats, links, Monday, new release, reading, Red Dirt Royalty, sports, stuff, TV, WIPs, writing. Bookmark the permalink. I can’t wait to read UtAM! And thanks for picking up SU! I’m so sorry about your revision hell. :hugs: I wish I could help somehow. I’ll try to remember about your FB party, but I’m such a wallflower at those things. You know how my weekend went. I edited my fool brains out on Saturday and then Sunday I was a puddle. Today’s better. And I’m back at it with Unequal already. So there’s that this week. And back to the activity plan – walking, exercising, etc. Might try to sneak in some fishing there somewhere. We’ll see.